In a large and deep skillet cook the bacon to a crisp and remove from pan. Drain all but 2 TBS of the bacon grease. In the same skillet add to the bacon grease the onion and cook, stirring occasionally until golden. Add the garlic and squash. Cover and cook for about 10 minutes or until the squash is just tender, stirring often. Add the kale, cover and cook for 3-5 minutes. Meanwhile cook the pasta according to the package directions. Just before draining, reserve 1/2 cup of the hot pasta water. Drain the pasta and set aside. Slowly add the hot pasta water to the egg yolk, stirring constantly. Set aside. 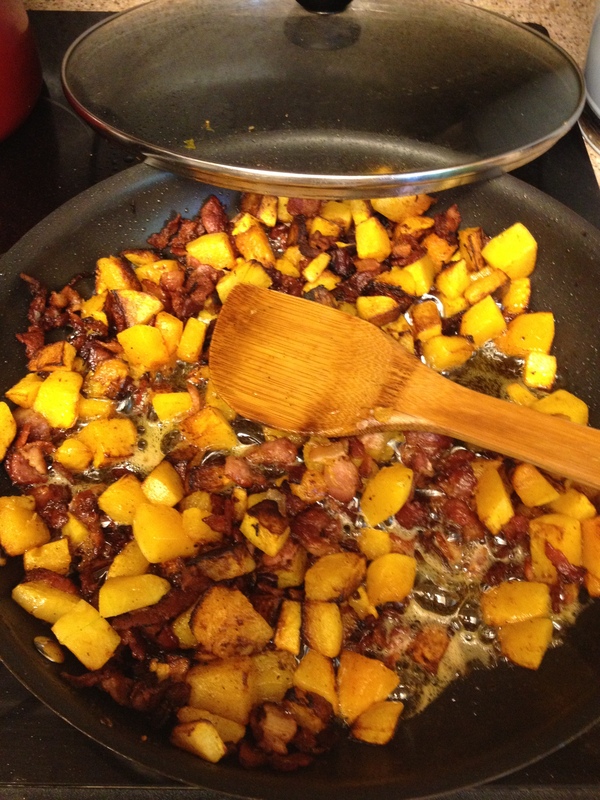 Add the wine and bacon to the squash and kale and cook for 2 minutes over medium heat. Pour the egg water over the mixture, toss well and pour over the pasta. Top with the cheese. Yum!